"Before you shed too many tears for the declining hit, remember that the era of the blockbuster was an anomaly. Before the Industrial Revolution, culture was mostly local – niches were geographic. The economy was agrarian, which distributed populations as broadly as the land. Distance divided people, giving rise to such diversity as regional accents and folk music, and the lack of rapid transportation and communications limited the mixing of cultures and the propagation of ideas and trends." When I came up with our company name, Bazaarvoice, I was inspired by The Cluetrain Manifesto and thinking about how word of mouth has always been the most powerful form of marketing. Human nature hasn't changed; it isn't like we all woke up last year thinking, "We need to communicate with each other more". What has changed is the ease of communicating in a globally-connected sense. This has profound implications for word of mouth and is driving an explosion in consumer-generated content. 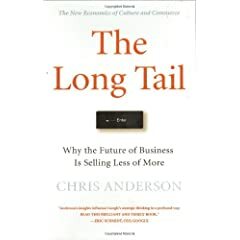 As Anderson writes, "the Internet's peer-to-peer architecture is optimized for a symmetrical traffic load, with as many senders as receivers and data transmissions spread out over geography and time". For all of the wonder of the Internet, it may be the most wondrous medium of all due to its power to connect people like we used to be connected locally (before the advent of the one-way, controlled broadcast medium). What am I missing from this list? And how do you think it will change your business? In this same issue of Wired, I was happy to see "The Power of Peer Production" named as one of the six trends driving the global economy, by Chris Anderson no less. "The Web is a democratizing force as the world's largest global brain. It educates everyone on the pros and cons of every product, service, and even person. An educated person doesn't react well to the traditional art of manipulation that some marketers attempt to employ in their campaigns. As a matter of fact, it makes them angry and defensive … like a cat backed into a corner. No one understands this new world of marketing better than the Eisenbergs. Waiting For Your Cat to Bark? is the marketing manifesto of our generation. Read it, weep, and then go do something about it." This might be a great gift Idea “for the man that has everything”. I received it as a gift. They sell subscription socks made in the US on the highest quality machines possible.